Looking for a stylish, uber water conservation toilet where poop has met its match? The green status symbol toilet? One that even Ed Begley, Jr. would be proud to park his rump on? Welcome Niagara Conservation’s Stealth, the first to the market .8 gallon per flush toilet. Yep. You heard me right. This clever toilet uses only .8 gallons per flush. HALF of the federal standard of 1.6 gallon per flush. Why the Stealth Toilet Stole My Heart. Anna, there is no way this .8 gallon toilet is going to flush the dirty dozen, poop, #2, or whatever name you use for the brown stuff. The Details are in the Flush. Can be used for residential to commercial applications. Retail priced at $308. (Note, bulk pricing available.) You can buy it on their Easy Being Green Site. It is also available on Amazon.com but it is more expensive. Hopefully, in a couple months, it will be available at large retail outlets. One of Niagara’s other toilets is currently being sold at Home Depot under another name. In addition, check your state or city for rebates to purchase WaterSense labeled products. How Much Is this Water Conservation Toilet Going to Save Me? 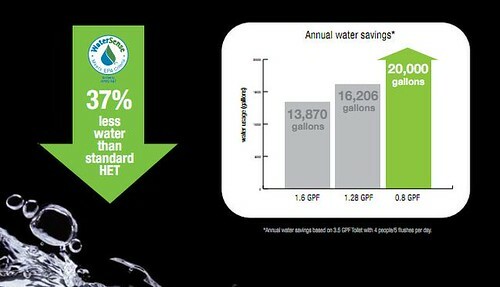 3.5 gallon to 1.1 gallon toilet saves 4380 gallons of water per year based on 5 gallons of water, and $27 in yearly savings based upon .06 per 1000 gallons of water. Note, this doesn’t take into account sewer charges. So, I am not sure where the Company derived its 20,000 gallons savings. However, when I extrapolate the above number based upon a 3.5 gallon to a .8 gallon per flush, it would seem that the toilet would save 5694 gallons and save $35 per year. Remember, sewer savings is not included. Of course going from a 1.6 gallon to a .8 gallon would yield smaller savings. Everyone, you are welcomed to jump right in and tell me if I did the math correctly. In any event, this toilet is worth exploring if you are retrofitting or buying new for both residential or commercial. If you do buy, make sure when you entertain that you point out your newest green member to your family. Talk about keeping up with the Jones. Would you swap out your 1.6 gallons per flush toilet at this time? Would you spend $300 for this toilet? Who wudda thunk someone could be so excited about a commode, but I’m stoked! Any savings is good in my mind! Liz, I love toilets. I just don’t know what to say. This is one heck of a toilet. Following the model numbers this appears be the same product sold under Glacier Bay name at Home Depot. The tank is smaller and not as “pretty”. I assume to differentiate from Niagara Conservation price/class. Michael, they do make products for Home Depot but I don’t know the difference between the above model and the Niagara line. We purchased and installed the Glacier Bay UHET toilet last week in our home. So far no issues at all with the flushing power of the toilet. It is very quiet, and does the job it was designed to do. The price for the Glacier Bay at Home Depot is much less than the cost of the Niagra, but not quite as attractive looking tank as the Niagra. Overall we are very impressed with the performance of this toilet so far. If you live in an area with high water costs or are just concerned about the planet this is a good investment and I am glad we decided to make this change. Wade, sorry for the graphic question. What about #2 flushing. Any problems? When I was at Niagara, the toilet failed a couple of times. Great article. My landlord installed this in my apartment and it is great. I am curious about any added maintenance costs or plumbing issues it may cause just so I know all the facts about it. I purchased the Glacier Bay version from Home Depot and it has consistently leaked and refilled from day one. I initially thought it was part of the pressure mechanism so I didn’t really look at it. Well, thousands of gallons of wasted water later, I find out it has been leaking and refilling every 10 minutes for close to a year. I take responsibility for not knowing enough about toilets to recognize this as a problem sooner(the water is now off). However, HomeDepot has quit selling them and no one remembers that they once did so can’t help me try to find the problem. Also, Niagara won’t call me back. I really want this .8 gpf toilet to work as I have never had any issues with flushing solids including wads of TP because we don’t flush every time we urinate. Lissa, my contact there has left. I senet a tweet to their social media team. Let’s see if they reply. I had a .8 niagra toilet installed by a company by the name of Restored Resources (by a woman none the less) and it is AMAZING!! I can see the savings in my home of 3! The shower heads and faucet thingys were changed too. Awesome company and awesome product! I love my Niagara .8 toilet too and am planning to purchase two more. The only issue we have found is finding a slow-close toilet seat for the elongated model that will stay up (both top and bottom) for my husband without his having to fiddle with it. It seems that the narrowness at the point where the toilet seats connect is the issue. But maybe there is a model out there that is narrow enough? Any suggestions anyone?? Another toilet to consider is from Mansfield. They make most of their toilets in Ohio, which is kinda cool. They have one called the Maverick that uses only 1.0 gallon, which is only a little more than the Niagara. So far it flushes great. I was really looking forward to replacing a very old toilet with this one. I ordered one through Amazon. The first attempt resulted in chipped porcelain at the back of the bowl. The packaging was just fine with no damage to the inner or outer shipping box. I actually could have lived with the chip being that it was at the very back and would never have been seen after installation. The bigger problem with this one and the next two replacement bowls that were shipped were show stoppers. All three had the same issue where the porcelain did not completely cover the ceramic base of the bowls. Obviously they were never inspected or they would never have shipped. To get three in a row like this says a lot about quality control. Unfortunately after three attempts I just returned everything for a refund. Needless to say I am extremely disappointed. Sits too high for proper squatting. Our shelf above tank blocks flush button. This design fails our test. THE MOST COMMON ISSUE WITH TOILETS? STOPPAGES! HAS ANYONE TRIED PLUNGING ONE OF THESE?……. NOT POSSIBLE, THE EFFLUENT IS FORCED BACK UP THE WATERWAY TO THE TANK!………. 35 YRS PLUMBING EXPERIENCE AND THIS IS JUST SMOKE AND MIRRORS……. I replaced three horrible 1994 Kohler Wellworth toilets in my home with a Niagara Stealth, a Kohler Santa Rosa, and a Toto Drake II. My favorite by far is the Niagara! This toilet uses the least water, is the quietest toilet ever, and is very quick to remove the waste. The water gushes forth like a waterfall from the front of the bowl pushing the waste towards the drain while the patented siphon action is simultaneously pulling it out. Fantastic! Don’t hesitate to purchase. The Niagara stealth does sit a bit high, but no higher than any other ADA compliant toilet. My other two toilets are the same height. It takes a little time to adjust to the new height if you’re not used to it. My toilet came with no chips or blemishes, bought from Home Depot ordered in for US 149.95. The best deal around! I should have bought three. The trashman has my three plungers which saw regular use with the old Kohlers.